When searching for the best exercise bike, reviews are an essential part of the process. Hearing what the experts as well as consumers have to say about a particular brand or model will help you narrow down your choices and find the ideal bike for your needs. Before making a purchase, you should take some time to read about the different styles of bikes available. While all stationary bikes share basic characteristics, in that they have a riding saddle or seat, pedals, and handlebars, after that, things get a little more interesting. Uprights have been around for decades and are the stationary models most people think of first. They fit like a normal bike would with a small saddle and pedals directly below the seat. Recumbents have a wider, fuller bucket seat with padded lumbar back support. Also, the pedals are positioned forward under the console. They typically cost more than uprights but are preferred by older adults, overweight people, and patients who ride for rehabilitation. Indoor Cycling models are similar to Spinning bikes, but encompass the entire category of heavy flywheel, highly customizable models that closely mimic an outdoor riding experience. Spinning bikes are high-intensity uprights that have a front wheel that spins. The seat is small and hard to encourage the rider to stand often while pedaling. These bikes are used in group Spinning classes at health clubs. Mini Exercisers/Under Desk aren’t really bikes so much as they are leg or arm exercisers. They have a very small frame with pedals. The user sits in a chair while pedaling, and they can be user on or under your desk. Dual Action are uprights with the addition of moving handlebars, much like the action on an elliptical trainer. These units give the rider both an upper and lower body workout. 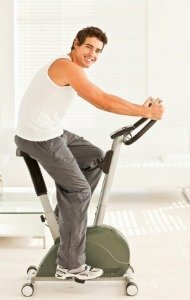 Rehab exercise bikes - If you have joint or circulatory problems, these cycles are a great way to put both the lower and upper parts of the body in motion for an effective low impact workout. Trainers or Rollers are bike stands that allow the rider to convert their road bike to a stationary bike, usually by taking off the front wheel and bolting it to a post, and setting the back wheel on a roller. From lower end like Schwinn to high end like CycleOps, there are plenty of choices. So finding the best exercise bike starts with deciding which type would suit your needs, then researching all of the available models within the category. Who Makes the Best Exercise Bike? We do home exercise bike reviews on all of the major manufacturers including Body Solid, Diamondback, Endurance, Healthrider, Horizon, Kettler, LifeCycle, Life Fitness, NordicTrack, Precor, ProForm, Schwinn, and Stamina. As stationary exercise bikes are far less expensive than treadmills and elliptical trainers, these fun cardio machines range in price from $150 to $300, with a number of the best exercise bikes costing around $400 to $600. All of our reviews include a detailed list of the specs and features, comments made by users and equipment pros regarding performance and reliability, and recommendations on best buys. On this site, we have articles about bikes in general and we offer reviews, as well as ideas on decent low-end models, and at what point it is time to invest in a more durable machine. Along with exercise bike reviews and the comprehensive comparison charts, we offer a buying guide and a list of what we consider the best exercise bikes of 2019, review accessories, and provide tips on workout routines and advice on maintaining your bike. We also introduce you to home ownership of commercial models as well as used (reconditioned) machines that are good buys, and offer tips on how to avoid getting ripped off when shopping for cheap bikes.